Comm Eye Health Vol. 16 No. 48 2003 pp 58 - 60. Published online 01 December 2003. A key issue in converting to sutureless cataract surgery is training. This article first describes the main surgical steps and complications of sutureless cataract extraction and their management. The second part reports on the training of 11 surgeons in sutureless cataract extraction at Sagarmatha Choudhary Eye Hospital, Lahan. The stepwise, supervised training is described and the learning curves of 11 surgeons analysed. A stable, self-sealing wound of appropriate size is the precondition for sutureless cataract extraction. To create a valve-like incision, the tunnel has to be prepared 1 to 2 mm into clear cornea before the anterior chamber (AC) is entered. The required tunnel size can be anticipated by the appearance of the cataract and patient age. Deep brown nuclei in older patients will need very large tunnels, whereas cataracts in younger patients may require incisions just as large as the IOL. Use of sharp instruments and good catching forceps (Paufique or Pierce type) for scleral fixation help to achieve the desired results. In deep set eyes, where the operating field is difficult to access, the tunnel should be prepared temporally or supero-temporally rather than superiorly. Dissection of the sclera is too deep and the AC is entered in the AC angle. The iris will easily prolapse and the wound will leak. Management: A more shallow dissection can be started at the other end of the tunnel. Suturing of the wound is required at the end of the surgery. The dissection of the sclera is too superficial. Management: Usually, this can be corrected by making a deeper frown-incision and dissecting the tunnel in a deeper plane, starting at the opposite side of the button hole. The keratomemay be blunt or the angle at which the AC is entered may be too shallow. Management: Injection of an air bubble at the end of surgery usually results in tip reattachment of Descemet’s membrane. Accidental removal of Descemet’s membrane and overlying endothelium will result in irreversible corneal decompensation. The anterior capsule can be opened either by capsulotomy or capsulorhexis. Capsulotomies are easy to perform. A capsulorhexis is more difficult, but will guarantee long term IOL centration. Rarely, an incomplete or oblique capsular tear will result, which makes mobilisation of the nucleus difficult. Management: Extension of the capsulotomy with scissors solves the problem. Peripheral extension of a capsulorhexis is the most common complication. Management: Anterior capsule staining and the use of capsule forceps (Utrata type) can reduce this risk. 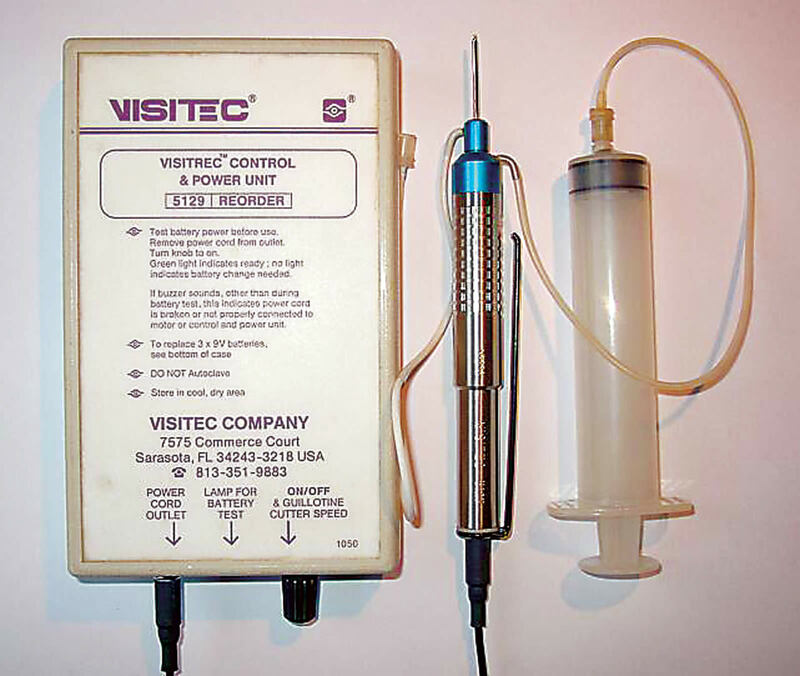 For a controlled rhexis, sufficient visco-elastic has to be injected to deepen the AC. The capsule flap should be gripped close to the advancing tear while pulling it centrally and slightly upwards. A failed capsulorhexis can be converted to a can-opener capsulotomy. Hydrodissection separates lens cortex with nucleus from the capsule. In conditions such as posterior polar, traumatic or hypermature cataracts with risk of pre-existing posterior capsular dehiscence, hydrodissection should be avoided. Management: Hydrodissection is most effective if the fluid is injected directly under the capsule. A variety of techniques can be used for nucleus delivery (see previous articles in this issue). However, similar complications may be encountered with all these techniques, especially when large nuclei have to be extracted. The nucleus cannot be tilted or prolapsed out of the capsular bag. Management: The rhexis has to be enlarged by radial relaxing incisions. Inadequate size of the tunnel will create unnecessary trauma during nucleus delivery. Management: After mobilisation of a big nucleus, it is wise to re-check the size of the inner tunnel opening. If the wound seems to be small compared to the nucleussize, it should be enlarged before nucleus removal is attempted. Management: In techniques where the nucleus is prolapsed into the AC before delivery, sufficient visco-elastic has to be injected above the nucleus to prevent endothelial touch. Excessive manipulations may result in iris damage, prolapse or iridodialysis. Management: Small, rigid pupils should be enlarged surgically by stretching, iris retractors or a sector iridectomy, before nucleus delivery is started. Risk of zonular dialysis is high after trauma, in hypermature cataracts and in pseudoexfoliation syndrome. Management: In small zonular dialysis, a PC IOL can still be implanted into the capsularbag or ciliary sulcus. However, in large dialysis, involving more than 6 clock hours, the capsule should be removed and an AC IOL implanted. PCR may occur during hydrodissection, nucleus delivery or cleaning of cortex. Management: Once a PCR is noticed, irrigation should be stopped and vitreous integrity should be checked. If the anterior vitreous face is not disturbed, remaining lens cortex can be aspirated, using as little irrigation as possible. In case of any vitreous disturbance, anterior vitrectomy has to be done. In settings with limited resources, a simple, battery operated vitrectomy machine can be used for managing PCR (Figure 1). If the cutter is immediately flushed with water and air after use, it can be re-sterilised and used many times. Bleeding may originate from the tunnel, from the AC angle or from the iris. Management: If bleeding is detected during surgery, it can usually be stopped, if the eye is left hypertensive at the end of surgery or filled with an air bubble. Small post-operative hyphaema with the iris still being visible can be treated conservatively. However, dense hyphaema and blood clots will need removal. We usually wash the AC through a newly made clear corneal incision and do not touch the original wound in such cases. Corneal oedema may be due to endothelial damage, high intraocular pressure (IOP) or both. Management: A good surgical technique and use of sufficient visco-elastic can reduce the risk of endothelial damage during nucleus delivery. With the ‘fishhook’ technique, the nucleus can be extracted directly out of the capsular bag, which makes endothelial damage less likely. Incomplete removal of visco-elastic is the most common reason for increased IOP post-operatively. Learning sutureless cataract surgery is demanding and should be taught formally. Surgeons should have consistently good, self-evaluated results with conventional cataract extraction before starting sutureless surgery. We analysed the first 100 operations of 11 ophthalmologists, trained in sutureless cataract surgery with the ’fishhook’ technique at Sagarmatha Choudhary Eye Hospital, Lahan. Seven surgeons had previously done a minimum of 800 sutured ECCE/PC IOL procedures, four had performed at least 400 phacoemulsifications. First day uncorrected visual acuity (VA) and rate of complications were recorded. Reasons for VA below 6/60 were analysed (Table 1). Table 1. Outcome and reasons for 1st day uncorrected VA < 6/60 for 11 trainee surgeons. Step one: Self-sealing incision and linear capsulotomy. Step two: Hydrodissection and nucleus extraction. Step three: Irrigation/aspiration and IOL implantation. ECCE surgeons needed a median of 58 operations, whereas phaco-surgeons needed a median of 30 surgeries until they had completed the first operation independently. This was mainly because the latter group already knew how to prepare the tunnel incision. There were no statistically significant differences between the surgeons concerning first day VA and complication rate. Complication rates were acceptably low, especially during the first 50 surgeries, where the supervising surgeon was still doing some steps of the operation (Table 2). However, complications while learning sutureless cataract surgery will be much more frequent if supervision and stepwise training are not available. * Editor’s note: This method of ‘Reverse Training’ is also described in Issue 42, 200, page 20.